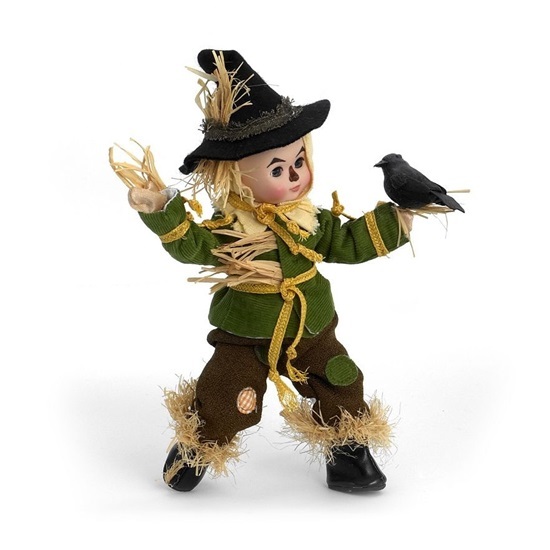 Re-introduced in 2012 is the Wizard of Oz Scarecrow, by Alexander Dolls straight from the cornfields! This 8 inch fully-articulated Maggie-faced doll has blue eyes and signature scarecrow face paint. He wears a green jacket and brown patched pants that are tucked into black boots and held up by a straw belt. He has on a black pointy hat trimmed with straw, over his straw hair, and of course straw accents throughout. A black crow sits atop his hat.